“Healthy Competition” at Last Rites Gallery. Opening March 8th, 2014. “Healthy Competition” New for the latest Last Rites Gallery group exhibit. 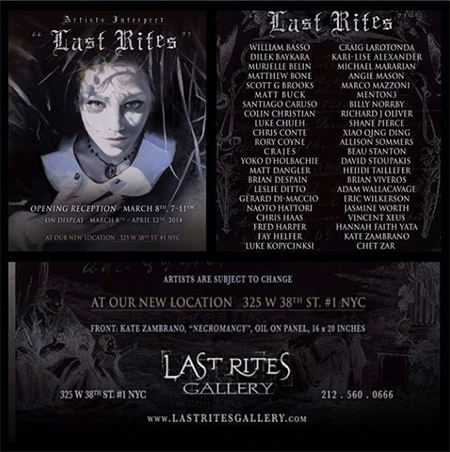 New York, NY (March 8th, 2014) – Last Rites Gallery presents “Last Rites”, a group exhibition bringing 40 artists together as they explore the theme of “last rites” and share their interpretation of this aging ritual. The concept of “last rites” dates back centuries in Catholicism and continues to be practiced on those nearest death. The practice of leaving those approaching death with these parting words in theory provides the beginning of a journey in the human passing from one world to another. The concept has been included in the work of notable artists throughout history, including the French Baroque artist Nicolas Poussin. In 1991, the term was chosen by Paul Booth to launch his business and brand. The name “Last Rites” began with Booth’s tattoo studio and years later, extended to encompass his gallery as well. 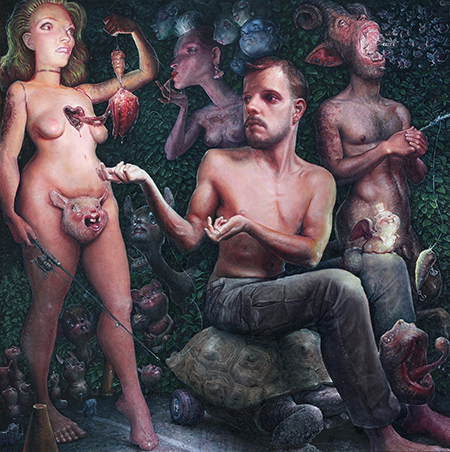 The macabre connotation of this term fit not only the dark nature of the artwork that both Booth and his gallery are known for, but for the rites of passage one experiences with the associated imagery. As Last Rites takes it to the next level with a new storefront location, owner Paul Booth and Director Erica Berkowitz thought nothing would be more fitting than to have a group show beckoning the universal term that also serves to name the gallery. The opening reception on March 8th will officially mark the opening celebration of Last Rites Gallery and Tattoo Studio’s new location. The party will commence at 7pm as Last Rites Gallery opens the doors to a fantastic line up of 40 artists and all three levels of its new space.